Here’s the story of an ad agency, a healthcare company and a wounded Marine pooling their efforts to help make injured people whole again in an unexpected way. It centers on Dan Lasko, who lost his left leg in 2004 while serving in Afghanistan. Now, Dan loves recreational and competitive swimming, and from the start he refused to let his injury slow him down. He’s competed in 30 triathlons since returning from combat, but there was one persistent frustration: Dan couldn’t seamlessly move between land and water using a traditional prosthetic leg. It’s a problem shared by many people who lose limbs, and often it can keep them out of the water and severely dampen their spirits. The agency quickly identified an underserved market. 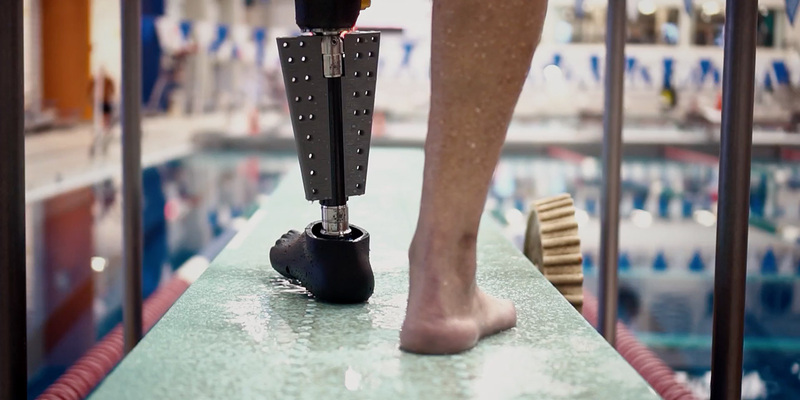 “There isn’t any sort of amphibious leg prosthetic that allows a wearer to embrace a more natural swim—[combining] land and aquatic activities—so we set out to change that,” James says. Once Northwell greenlighted the project, the team searched for a veteran to help guide the Fin’s development and star in a promotional campaign. That process turned into equal parts casting call and test-pilot recruitment. With Lasko’s input, the team produced a 3-D-printed prototype they believe goes well beyond what previous amphibious limbs have to offer. It took five months from the Fin’s inception to Lasko’s first test swim in a Long Island public pool. After some design tweaks, the high-tech limb performed—well, swimmingly. Lasko was able to glide smoothly through the water, and execute exuberant cannonballs from the diving board, with equal ease. But according to the former Marine, it’s not all about him. Along with the film, JWT also launched a digital content hub, social posts and PR support. What’s more, in a world where agency services have become increasingly commoditized, the collaborative nature of the project allowed Northwell and JWT to form a tight bond.